Heleen joined NZCER in 2016. She leads our research and development activities, calling on her previous experience as a manager of research and evaluation at the Ministry of Education. Heleen brings extensive experience and knowledge of education policy, research and evaluation, and assessment. 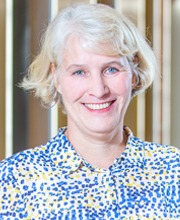 Heleen is the immediate past President of the New Zealand Association for Research in Education. Heleen has an MA (Applied) Social Science Research, Victoria University of Wellington, and a BA (Education), University of Canterbury.